Lynn's Industrial Protocols over IP: TCP/IP Encapsulation Limited by Distance? Summary: serial tunneling or TCP encapsulation is NOT directly affected by distance. However, it is affected by "hops" or how many routers and segments it goes through. 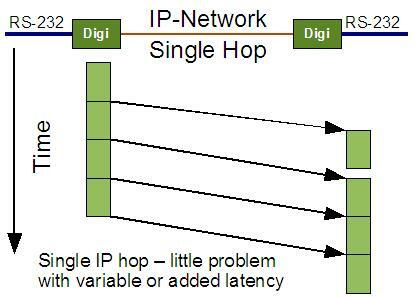 To reduce the effect "hops" have on your TCP/IP Encapsulation, you need to set the correct options in your Digi Device Server. These are NOT standard defaults since what works best for Wide-Area-Network is not best for local direct Ethernet links. What is serial TCP/IP encapsulation? It is also called serial bridging or serial tunneling. Think of it as the modern IP equivalent to old short-haul modems or leased line modems. At each end you have a "modem", you connect a serial cable to each, and you create a virtual serial link running from end to end. During a webinar I gave, a traffic-industry user asked if serial TCP encapsulation is limited by distance. If he serial bridges between 2 intersections of a road, things work fine. However, if he tries the same serial bridge between an intersection and the home office, then serial bridging does NOT work. So he was wondering "what is the distance limit for serial bridging or encapsulation?" The simple answer is "There is no distance limitation". However, the longer the distance you move your serial encapsulation, the more routers and network segments (hops) your traffic moves through. 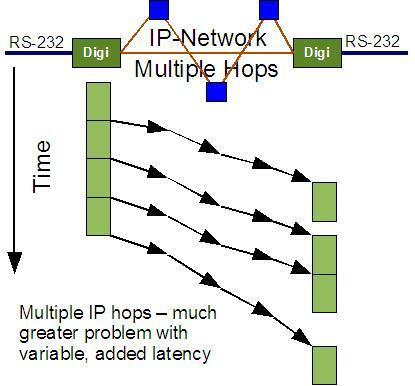 The more hops your traffic moves through, the more variable latency (or delay or jitter) is introduced between consecutive network packets. This affects the timing and different protocols and software implementations react differently to it. Let me just throw some hypothetical numbers together. Let's say the device sends data as a block of 100 bytes; the receiving device will loop and collect this data. Of course the receiving device cannot just wait for 100 bytes - what if the line breaks? It could sit there forever waiting for the end of the message. So various timers are coded to enable the receiving device to understand failure and abort receiving. Let's say the receiving device waits at most 20 milliseconds for the next byte. On a direct serial link this is very common - once the sending device starts sending data it is very unlikely that even a 2 or 3 millisecond gap will appear between bytes. How to solve this problem? On the Digi Connect products, you'll be using one of these serial port profiles: TCP Sockets or Serial Bridge. Under the Advanced Serial Settings you need to enable the check box labeled: [ ] Send data only under any of the following conditions. If you do not check this option, the Digi Device Server purposely fragments the serial data into many TCP segments to provide more realistic end-to-end performance on direct Ethernet links. However, since you want to move data through a wide-area network, you are less concerned with raw throughput than in preventing message fragmentation. You may also be interested in creating fewer TCP/IP packets to send more serial data. Changing this setting accomplishes both of these things. "Send when data is present on the serial line" allows you to define an end-of-message pattern such as a carriage-return (\r or \r\n, etc). "Send after the following number of idle milliseconds" allows you to define an idle or quiet time to wait before sending data. This second option is generally safest and I find a value of 10 or 25 milliseconds to be ideal with most automated devices. Note: do NOT change the setting in the "Send after the following number of bytes" field! This is rarely useful and it does NOT mean (when unchecked) that the Digi Device Server must see 1024 bytes before it sends anything. I have had too many users change this to 1 and then wonder why they have a huge amount of network traffic!